Lush is one of the best beauty stores ever. I mentioned in this post how much I love their Big Shampoo. I am also a pretty big fan of their bath bombs and face masks. I don’t buy things there very often, because they are pretty spendy. However, the bath bombs and soaps smell so good that I put them in my drawers to make my clothes smell yummy. I have also used Lush bars of soap to make liquid hand soap. Their products are great because they are natural, but they do use dyes. I am allergic to a few red dyes, so I have to be really careful. I recently got a gift card for Christmas from my friend K, and I bought a few fun things. One was the Popcorn Lip Scrub. Lip scrubs are definitely a frivolous thing, I’m pretty sure you can easily exfoliate with a washcloth. However, I am a frivolous, and my lips get chapped in the winter. 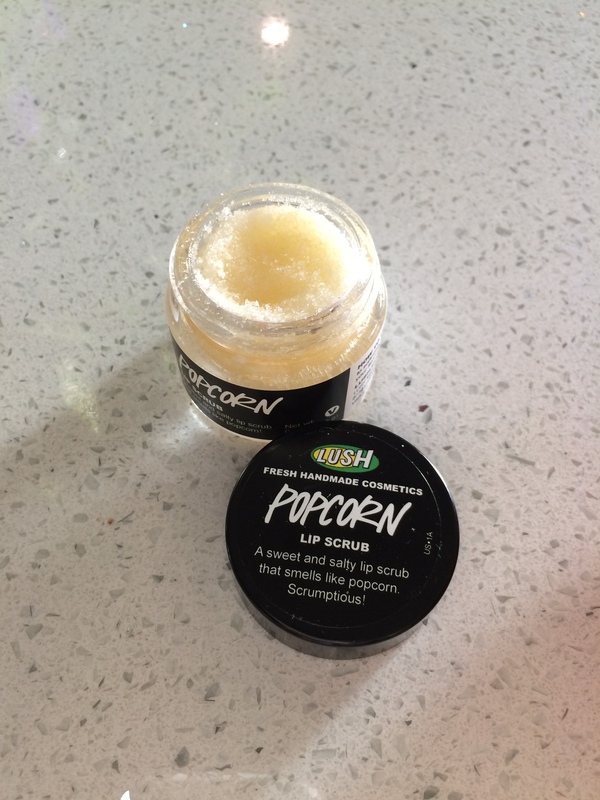 You just rub a bit of this on your lips, and no more chapped lips! It also smells and tastes yummy. At some point I want to make some myself, and I will post the recipe. Something we found out about Lush when I got engaged was that many locations let you throw a party there after hours! My friend K and my sister planned a stop there for my bachelorette party. You reserve the store after hours, and they let you bring your own food and drinks. You need a minimum of 10 people, and each person has to purchase $25 worth of products (the rules probably change periodically). That’s it! Basically, it’s free, because you go home with the products that you choose. 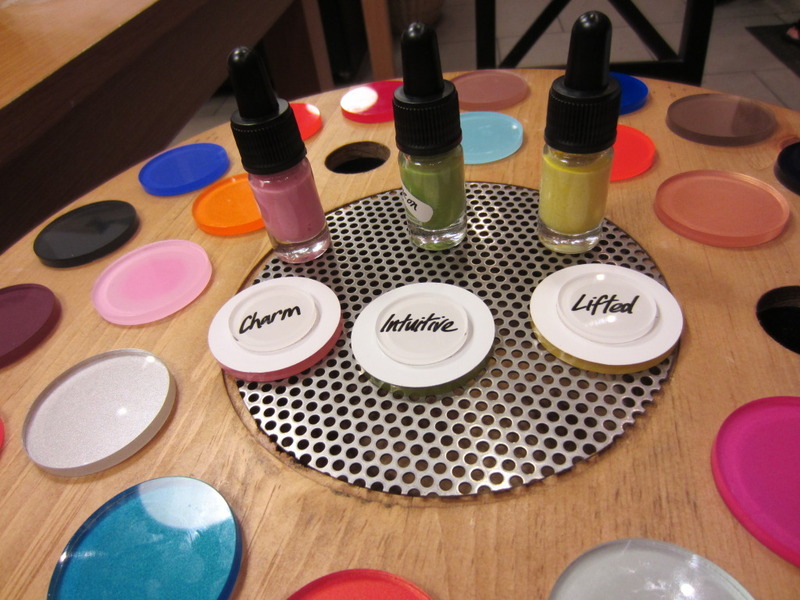 They did our colors with this color wheel, and gave us each a mini facial and hand exfoliation. We got to play around with the make-up and give each other makeovers. It was a super fun girl’s night- plus we were all made up when we went out afterward. Does anyone know of other places that let you do cool private parties? Yes 🙂 oh how I love Lush! What an awesome idea, thanks for sharing! I’m obsessed with Lush and I’ve been trying to think of unqiue ideas for my bachelorette party as well! 🙂 Congrats by the way! Oh you should definitely call if there is a Lush near you. We had so much fun, and the price is right 🙂 congratulations! What a classy fun idea! You and your friends look so cute! Do you mind my asking how much you weigh then, as you looking amazing? I am a certified LUSH aficionado; and as reader of your blog, I will let you on a few secrets to make your next visit even more stellar. 1)They have to give you a free sample with each purchase- just ask and you shall receive. 2) They hold a buy one get one half soap deal the day after Christmas. 3) They do have coupons if you sign up for the paper newsletter. 4) Read the product directions sometime for a good laugh, but if you want a good time, follow them! We are adorable (see, I’m working on my positive thinking!). I think I weighed around 145 there- still way too much in my opinion, but perhaps I need to alter my way of thinking. I was running a lot then, so I had more muscle. (Smile) More women need to realize working out produces muscle, which will keep your size about the same but just give yourself a fabulous toned body. As you said, you need to alter your way of thinking and find your best self. Hello my name is Penny , I was just wondering if you do parties at someone’s house , and bring some of your lush items to sell ( a bit like body shop) . I would be interested in holding a party if you do . Please could you get back to me and let me know if you do . I don’t, but thanks for asking.